In the fall of 2009, Burney High’s and Fall River’s Friday Night Live and the middle school’s Club Live youth decided to focus their efforts for the school year on an underage drinking project. The project included research, the distribution of surveys to all students in grades 7-12, parent surveys, store assessments, and a “Sticker Shock” campaign. The year-long project culminated in a Town Hall Meeting at which youth shared their findings and data analysis with members of the community at large. The event was sponsored by the Shasta County Chemical People, Inc. Partial funding was provided by a grant from the Friday Night Live Partnership and the California Office of Traffic Safety (OTS), through the National Highway Traffic Safety Administration. 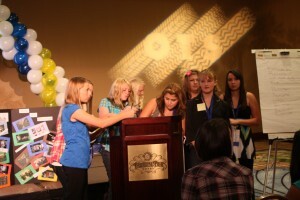 During the summer of 2010, the youth prepared a presentation of their underage drinking project which they presented to high school youth and adults at the OTS Youth Summit in Anaheim in September. Building off the success of their underage drinking project, the youth decided to tackle the issue of distracted driving as their 2010-2011 focus. In the fall, they collected data on the topic, and in January, they staffed a table at high school and junior high basketball games where they asked those attending to answer the question, “What do you consider lethal?” Responses were written on a large sheet of paper and were posted for all to see. The youth then categorized the answers and developed announcements for the school’s daily bulletin which tied the community’s answers with facts about distracted driving. Later in the spring, youth created a club sweatshirt which they all wear proudly. In May and June, presentations on distracted driving were made to the Burney Boosters Club, the Burney Rotary Club, and all the students at the junior and senior high schools. The presentations stressed the “X the TXT” campaign developed by Allstate Insurance and locally supported by Hilliard Insurance Agency. This year’s work was sponsored by the Shasta County Chemical People, Inc. with partial funding provided by a grant from the Friday Night Live Partnership and Allstate Insurance. It’s summer once again and Club Live members are preparing for the OTS Youth Summit to be held again in Anaheim in September.